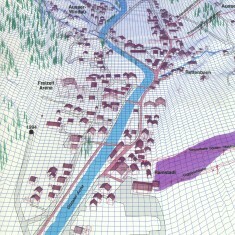 Sölden Transportation | Sölden Transportation | Ecosign Mountain Resort Planners Ltd.
A major planning and design study was completed during the winter season of 1992/93 in the Öztal of Austria. 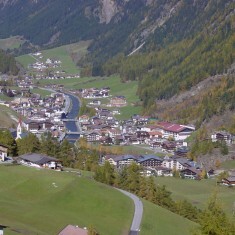 Due to a large hotel base in Sölden, the traffic problems of the Ötztal are concentrated in the Village of Sölden. The objective of the study undertaken by Ecosign was to measure and analyze the severe traffic congestion problems in the Village and to provide design solutions to reduce traffic and thereby improve the quality of life for local citizens and the tourist experience. 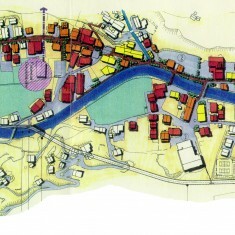 The Village Concept was proposed as a solution for the resort’s vehicular traffic and skier staging problems. The proposed solution included a bypass road/tunnel which in effect will terminate the existing highway through the village and result in the creation of a Pedestrian zone and a central gondola terminal. Twenty years after Ecosign’s original concept of a bypass route, the Gemeinde of Sölden is undertaking community workshops of the newly engineered plans and receiving positive feedback from the citizens of Sölden. This project may finally be realized within the next decade.